Hello, Radiant One and a very big and a very warm welcome to today’s video! In today’s video, I wanted to share with you a great shift that happened for me in terms of the way that I pray or my prayers and essentially actually also the big mistake that I discovered that I had been making or made with prayer. The one thing that I know in terms of the loving, kind, caring, and compassionate source that we stem from – some call it God, some call it the divine, some call it Mama. Whatever you want to call it; I call it love because I don’t see it as a human or a person. I see it as a field of energy and a loving source that I and you and everyone else comes from whether we are aware of it or not. With us being born into this world, there is one thing that is given us as a “birthright” and that is our free will. With that free will comes our right to deny our source or not and of course I am of the belief that when you deny your source – and I don’t mean this in a religious way and I also don’t believe that prayer is a religious thing even though I know it’s practiced in religions. So to me I just want to make that clear that for me it’s not about religion and it’s not about anything religious. To me, prayer is a communication. It’s a form of communication with the source from which you stem. It’s not something outside of yourself. It’s not an old white man. You don’t have to kneel. You don’t have to fold your hands. It’s a way of the heart. It is a direct and open communication, a channel that is available to you 24/7, 365 days a year. Now I think I’ve gotten that out of the way. As I said, with that comes also the free will, our free will, and our free will sometimes means denying our source, denying from where we came. Of course, to me that means also that when we do that, we experience a sense of lack. We experience dissatisfaction, being out of alignment, out of resonance. It’s like something’s off and something’s missing, although you can’t put your finger on it. My belief is that because we’ve made that Source, because we’ve chosen to make those connections or communications and that Source into something religious, a lot of people will actually deny it because they don’t – they’re not alignment and don’t resonate with religion, as I don’t. However, we still have free will. What I realized in that was that when I was praying for clients, I was actually encouraging Source to take away the free will of people. If there’s something that I as Enneagram Eight is all for, it’s freedom, it’s having your own personal freedom and your own personal free will. What Source can do is support you in the elevation of you to a point where you can see that that is already in your life. It can elevate your point, your energy, and your source to a point where you are actually met by that which you want, because it’s already there. That way, I’m allowing Source to really just expand and submit out into the world and those with whom that resonates and makes sense can then by their own free will, choose to come my way if that serves both of us. That’s the point of today’s transmission is to look at the way that you’re – I’m not saying you’re doing it wrong. I’m saying I made a mistake in the way that I was doing it and I’m hoping that I may inspire you to see if there is a subtle change that you can make that would actually create tremendous shifts. Because I will tell you this: After I changed my way of praying, I have had more people reach out to me for interviews. I have had more clients reach out to me. I have had more people sign up for my newsletters, for my programs. More people view my videos and listen to my podcast. The “only” thing that I really shifted was within. So that’s again to me – you know, if you want to change something in the world, you have to change it within your world, within yourself. That means that for example my experience was I was on a plane and there was very, very strong turbulence and rather than praying to be taken out of the plane which would be impossible, at least at that current state of consciousness and where we’re at currently, rather than praying to ask to be taken out of it, I asked that I may be given the tools to go through it. What happened was this deep, deep sense of relief and peace that came over me. I do this as well when I have to speak – if I have to do an interview or I have to speak somewhere. I ask again for the tools and guidance to go through with it and to go through it rather than be taken out of it. Please share with me in the Comments below your biggest takeaway or your biggest a-ha from listening to this video? 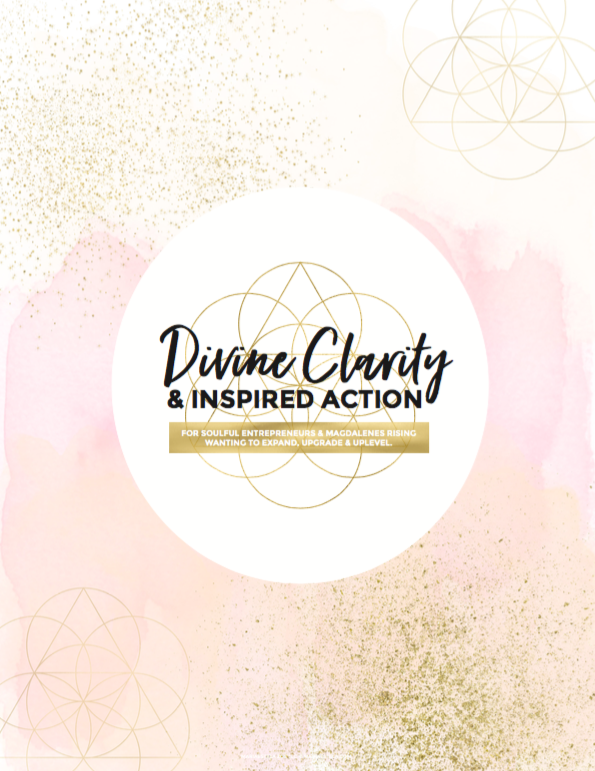 Get your own free copy of Divine Clarity & Inspired Action. The guide will help you move from overwhelm to confident in 60 minutes. Gain clarity, prioritise and know exactly what next step to take. This is great, dear friend. I listen to your podcasts and I’m so glad Suellen has joined you. I want to be part of your group at some point as well. This was a good call for me. I understand that our environment must also be ready to interact with us. So, the prayer of asking for help to be the person who can receive is powerful. And useful. Love it. Love you. Keep inspiring us all. Wencke. Thank you dearest Wencke! Love you!